Baliza effortlessly combines the timeless and the modern. Wrapped around its classical form is cutting-edge innovation, including a four-function pull-out wand that attaches with new MagneDock™ Technology. 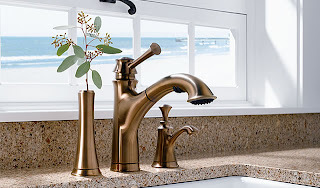 Baliza is the first pull-out or pull-down kitchen faucet to allow water volume to be controlled from the wand.